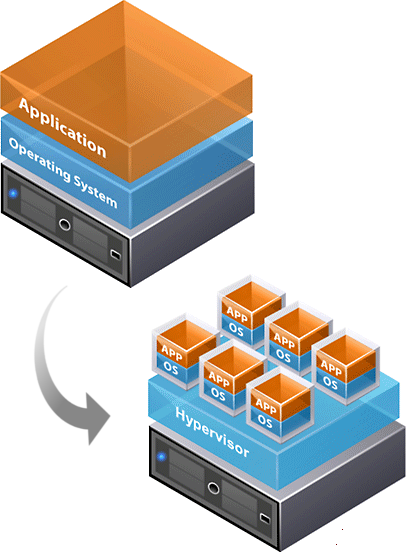 Improve the efficiency and availability of IT resources and applications through virtualization. Start by eliminating the old "one server, one application" model and run multiple virtual machines on each physical machine. Free your IT admins from spending so much time managing servers rather than innovating. About 70% of a typical IT budget in a non-virtualized datacenter goes towards just maintaining the existing infrastructure, with little left for innovation. There seems to be a bit of confusion about the benefits of server virtualization, with many tending to focus on cost savings. As a business that has been running a virtual infrastructure for long time, we can honestly say that virtualization is not so much about saving money (although you certainly will) as it is about better resource utilization, more reliability, and greater flexibility. Pool common infrastructure resources and break the legacy "one application to one server" model with server consolidation. Securely backup and migrate entire virtual environments with no interruption in service. Eliminate planned downtime and recover immediately from unplanned issues. Respond to market changes with dynamic resource management, faster server provisioning and improved desktop and application deployment. There is no question that most of our servers are doing nothing about 90% of the time. This becomes quite obvious with even a cursory glance at historical utilization data for any given server. It would seem that the obvious solution for this would be to simply run more applications on each one, but the reality of this is that the more apps you install on one operation system, the more unreliable it becomes. Consequently, what we all do instead is buy a new machine every time we want a new app that we think is "critical", because we want to be sure it has its own sandbox to play in. So, we find ourselves with racks and racks of servers consuming more and more space (at a cost); all generating heat which we must cool (at a cost); all pulling more and more power (at a cost); all requiring more and more time to manage (at a cost). Virtualization offers a way to safely put more than one operating system (or virtual server) on one piece of hardware by isolating each operating system from any others running on the box. Essentially, you are establishing a bunch of sandboxes on one piece of hardware. If one of the virtual servers crashes, hard or soft, it will have no impact on any of the others on the box. Hardware resources are better used since, rather than having 10 independent servers running at 10 percent utilization each, you can have 2 running 5 virtual servers each for a total of 50 percent utilization per box. It's important to note, before any discussion on reliability comes into play, that a virtualized operating system is, by nature, hardware agnostic. This means that it can easily be moved from one piece of hardware to another, even if that hardware is of completely different design, without modification and often without shutting the system down (live migration). In a properly designed system this can dramatically reduce the time required to bring a failed system back up. However, virtualization, by its very design, dramatically increases the impact of a single system failure, as a variety of services will be impacted when multiple virtual servers go down simultaneously. This is where the "properly designed" comes into play. In the simplest sense, it can be argued that less total hardware means a lower likelihood of failure, but this argument doesn't get very far. Too often, people virtualize individual machines that were never designed to be virtualized, using their internal storage as a repository for their virtual machine images. Basically, they set themselves up for a huge catastrophe should a hardware failure occur. This sort of setup is actually less reliable than individual machines, and introduces more risk than one should be willing to accept in a mission critical environment. Properly designed, however, a virtualized infrastructure can provide far greater reliability and less down time than an infrastructure of individual machines could ever achieve. The keys to the design are redundancy and shared storage. All individual pieces of server hardware must be redundantly linked to a properly designed SAN (Storage Area Network) or other shared storage device, where all virtual machine images are stored for a user to realize the true reliability benefits of server virtualization. Finally, and perhaps most importantly, virtualization provides flexibility, or what we like to call, an agile infrastructure. Imagine, for example that one of your virtual machines is consuming too many resources on the box it's on, lets say processor time. People are complaining that things are slowing down. You say, "no problem", and move the virtual machine to a box with a faster processor. Or, you take advantage of virtual SMP, and simply pin another processor to the virtual machine. Ever needed to add more RAM to a server because a process has outgrown its allocation? No problem - simply allocate more RAM to the process. No pulling the server, no extended periods of down time. KVM and VMware virtualization technologies will even allow allow you to pin additional CPUs and change RAM configurations live, without taking the virtual machine down. Deployments are equally easy. Once you have one image of an operating system, you know that it will work on any hardware, so you never have to sit and watch an installer run, followed by endless online updates again. Simply copy the image and fire it up - you're ready to install that new app in less than 5 minutes. How much are you paying people to do this sort of thing, when they could be working on more important things, like innovating! Nevian provides a bundle of hardware + software + services which will allow a quick transition to a virtualized server room. The bundle comprises rack systems, storage units (SAN), servers, configuration and support.